The point was made that, as the issue of security expands to include, economic, environmental and political security, nations and international organisations should develop and maintain trusting relationships to secure, not only the already established concepts of security, but the lack of security within a nation of individuals, which was argued to be the most threatening form of human rights abuse. On the other hand, issues current seen as internal issues should be treated on the cooperative and international level. Issues such as, providing food and giving mutual support in times of need. The lack of balance between international and internal priorities, military and diplomatic solutions, male and female, old and young are the reasons for the difficulties involved in establishing a culture of support both at home and abroad. After showing agreement towards the previous statements labelling the need for a balance in human rights efforts, the third speaker, Prof. Siddharth Saxena, expresses the concern that human rights is becoming a divided from it’s essential partner, human values. It is easy for human rights to be used as an instrument to impose what we think is right on others. When we forget that rights and duty are connected, solutions can’t be sustained. Prof. Saxena questions, “do we personally belive human rights are useful or are they just something we accept?”. It is dangerous to not ask this question because religion and politics has had a tendency to cause devaluation of the personal, individual human rights. The second half of the talk questions what practical steps can we, the international community, take to allow people to uphold their rights in times of crisis. Terrorism, financial difficulties and environmental deterioration can be dealt with primative initiatives. Natural disasters, on the other hand, can, and will, happen suddenly. War can be waged anywhere in the world in 6 hours, but it takes days to get food to people affected by natural disasters. He proposed standing funds, pooled by all nations, to be kept at hand in order to provide relief to those victims of disaster. At hand should also be political expertise, military might and medical aid, provided by all those that can. How we can build such systems and partnerships should be the next question being asked. Baroness Sandip Verma asks a question very early on, “When we talk about human rights, do the east and west have differing ideas? Do we categorise or throw everything into 1 pot and hope everything works out?” In the west, we have issues of gender identity. We have given women the vote, race issues are being resolved but the first for women equality is still going on. “Are my (woman of foreign decent) rights the same as everyone else in the country?” Academic debates centring on human rights rarely answer simple questions like these. The polarised idea of human rights doesn’t often address the needs of the developed individual. As a result, Baroness Verma points out, even a liberal democracy, still contains an imbalance of human rights. Next, she stresses the value of economic freedom in empowering people who have their human rights abused. Noting the difficulty of achieving liberation with out the freedom that money offers, Baroness Verma pushes this as one of the most powerful steps an organisation can take to allow people to do what they want. Urging us to keep in the front of our mind, the internal and often hidden rights abuses of the individual, especially when dealing with macro shifts in the empowerment of people, such as the Arab and African uprisings, Baroness Verma urges us to actively search for and recognise the abuses of human rights in all aspects of society. Dr. Yong Cheong Song, the European Director of the Universal Peace Federation, starts by clearly stating the purpose of UPF in securing the human rights of others and pointing out that the measure of a nation is taken from how they protect the human rights of its citizens and those abroad. After giving a brief summery of the human rights abuses suffered by UPF’s founder Rev. Sun Myung Moon, he tells us the role UPF should take in protecting the rights of others and the attitudes of empathy, forgiveness and reconciliation that should be adopted. To get to the root of the problem of abuse, he recognises a need to establish clear answers to some fundamental questions. What is the true basis of human rights? Why do people violate the human rights of others? With these questions answered, greater steps can be taken to prevent the abuse of other people’s human rights rather than just cure and aid those who have been abused. Dr. Song calls on the religious community to take a proactive role and become a driving force to find long term solutions for the problems faced by the unempowered. Solutions such as establishing an inter-religious branch of the UN of similar power and responsibility, combating moral failure resulting from spiritual poverty. He closes with some suggestions on how to improve the awareness of the rights of others such as, school based education, teaching the value of correct treatment of people, pointing out that, in a culture of selfless love, the concept of human rights would not exsist. Spokesman on London for the Liberal Democrat Party, Tom Brake has taken a leading role in civil liberties and human rights issues. At an early age, he became actively involved with Amnesty International and Greenpeace, and his involvement in advocating civil rights has continued throughout his life. He is a host for this conference in Parliament. 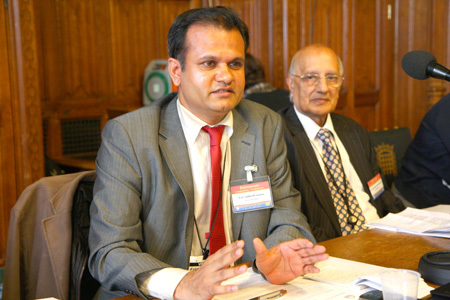 He was elected as an MP since 1997 and appointed a member of the Privy Council in 2011. Vice President of Women’s Federation for World Peace (WFWP) International and President of WFWPI in Europe, Deputy Director of the WFWPI Office for United Nations Relations and its Permanent Representative to the UN in Geneva since 1997, Coordinator of the UN Office of UPF in Geneva, Carolyn Handschin has been contributing to the work of the Human Rights Council in the areas of peace-building, leadership and governance, women’s human rights and their empowerment, education for peace and fulfilling the MDG’s. Previous Secretary of the UN-NGO Committee on the Status of Women and current member of the Committee, as well as the Working Groups on “Peace”, and “Human Rights Education and Learning” at the United Nations in Geneva. She contributed to the NGO task forces on “Disarmament” and “Culture of Peace”, the latter of which she chaired. She is a Founding member of the Fribourg Peace Forum in Switzerland and Co-founder/Vice-President of the Geneva Interfaith and Intercultural Alliance (GIIA) currently coordinating its “Youth Interreligious Council” Model-UN program. Previously Councillor of Sandwell Metropolitan Borough Council for 28 years and deputy Mayor from 1982 to 1983. He was created a life peer as Baron King of West Bromwich, in the County of West Midlands. As a Universal Peace Federation (UPF)-UK patron and International Presiding Council member, he represents the UK to the UPF Global Peace Council and is a host for this ‘Human Rights and the Protection of the Unempowered and Dispossessed’ conference. Chairperson of the Cambridge Central Asia Forum, Director of Cambridge Kazakhstan Centre and Honorary Secretary of the Committee for Central and Inner Asia. He trained as an anthropologist, historian and a physicist and is a Fellow of Jesus College at the University of Cambridge. Other than the highly regarded research into magnetism and superconductivity, he has put considerable research time into the areas of religion and identity, knowledge systems, social and political development and institutional history in Central Asia and the Middle East. Taking the position of Regional Director for The Universal Peace Federation in Europe and European President of the Family Federation, he has the overall responsibility for the activities of the Unification Movement in 36 nations of Europe since 2003. Previously he worked extensively in senior roles for UPF and allied organisations in Kenya, Australia, New Zealand, The Solomon Islands and Oceania. She is a British businesswoman and currently a Government Whip and Spokesperson for the Cabinet Office, International Development, Equalities and Women's Issues in the House of Lords. In 2006 Baroness Verma was made a Patron of the Tory Reform Group. 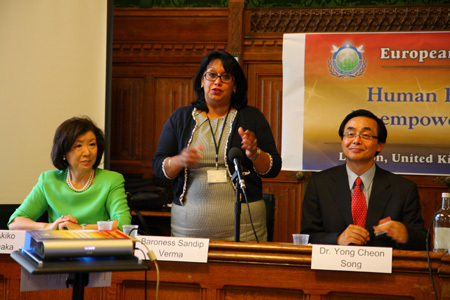 She was created a Conservative life peer as Baroness Verma, of Leicester in the County of Leicestershire. With the strong belief that you can make a difference by empowering people to help themselves, she speaks about innovation, forward thinking and skill development. Professor Akiko Yamanaka is former Vice-Minister of Foreign Affairs in Japan, currently Professional By-Fellow of Churchill College, Cambridge University and Visiting Professor at the Science Academy of Chiba University of Commerce. She is Member of the Advisory Group on International Peace Cooperation for Japan’s Ministry of Foreign Affairs, Advisor for Research of the Japan Institute for International Policy Studies and Board Member of the Global Partner Forum 2010. Professor Yamanaka has held numerous academic positions throughout Japan including at the United Nations University and Hokkaido University, in addition to international postings in Germany, Sweden, Russia, the United States and the United Kingdom. She has had a long-term presence in the National Diet of Japan as Member of the Committee on Foreign Affairs, specialising in diplomacy, security issues, peace building and crisis management. She holds the OISCA Award in recognition of her contributions to Asia and has also been awarded the International Soroptimist Japan’s “Sen Kyoko Prize” for her contributions to international understanding.